With so much focus on losing weight and the benefits that strength training provides us, we sometimes overlook one very important pre-aspect of successful strength training – flexibility. Truth is, stretching exercises that increase flexibility are easily some of the most overlooked forms of exercise, yet flexibility is the reason you can perform in the first place! Most anyone who goes to the gym and works out knows of the importance of stretching before beginning their exercise routine, however, stretching exercises are not created equal. Let’s examine the types of stretching you can perform. This type of stretching requires you to move your body through an increased range of motion using body-weight movements like lunges, push-ups, squats, side lunges or jumping jacks before beginning your workout. Unlike static stretching that is passive, dynamic stretching is “active” since the muscle you are using is contracting and relaxing. Performed correctly, you should be in a “light-sweat” and ready for your cardio or lifting session afterward. This type of stretching is not as beneficial before working out but best used after you are finished working out. When you perform this type of stretch, you must elongate the muscle and hold that position for a defined amount of time – usually around 20-30 seconds. It is a passive stretch that allows the muscle to adapt slowly and remain relaxed throughout the entire exercise. Static stretching can alleviate muscle soreness. It is a safe way to begin – especially for individuals that have led sedentary lives. Sometimes confused with dynamic stretching, this type of stretching is intense and uses bouncing movements to push your body past its normal/comfortable range of motion. Dynamic stretching does not require any bouncing or jerking motion nor does it push muscles past their normal range of motion. However, stretching movements that are too forceful can easily damage soft tissue such as ligaments and tendons around joints eventually causing tendinitis. Small muscle tears lead to reduced flexibility and range of movement. Because of the danger of straining or pulling a muscle, ballistic stretching is usually not recommended for those who simply want to stay in shape or improve flexibility. Static stretching is much more gentle on the muscles and a much better choice. Stretching is the key to increasing flexibility. The more flexible you are the easier it is to perform daily tasks as well as your workout routine without incurring injury. Static stretching is best used after your work-out when your muscles are warm and your joints and ligaments are more elastic. Dynamic stretching: Best used before a work-out because it actively engages the muscles to relax and contract. Ballistic training: Best left to the pros. Always consult your trainer before performing this type of stretching. Be aware that even stretching can be overdone. Too much static stretching and you’ve opened the door to injury. In order to maintain mobility your joints need attention. If you don’t use it, you’ll lose it. 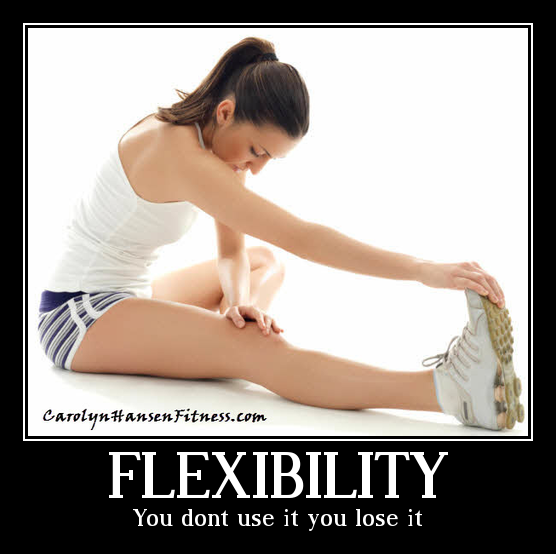 Just as our muscles wilt and shrink from disuse and age, if we don’t pay close attention to our flexibility, we lose that too! Every joint should be taken through a full range of movements daily for maximum flexibility. Stretching and flexing your muscles should not stay at the gym. If you are really interested in maintaining or increasing your flexibility, static stretches should be done daily. If you fail to challenge your joints and muscles to stay strong they will continue to weaken and fail.